When designing and installing optical fiber cables, one must forecast the future. How many fibers and what types will be needed? Starting with today's needs, one should add a few fibers as spares in case we underestimate the number needed or some are damaged in installation. For the future, what new systems will be installed and what fibers will they need? Will routes for the fibers change? Generally, big changes would require installing more cables. Back in the early 1980s, when everything in fiber optics was changing rapidly - even more rapidly than today - British Telecom came up with a different idea. 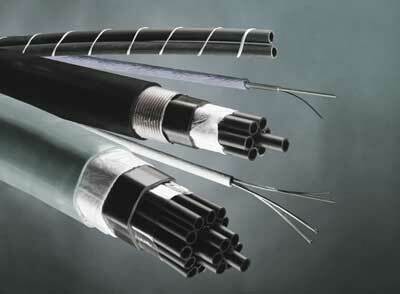 Why not install tubes along cable routes and use air pressure to blow fibers down the tubes. One could add extra tubes for future use and even blow out unused fibers and replace them with new ones. Today, air blown fiber (ABF) systems are well developed, available from multiple vendors and some installers are trained and experienced in their installation. The hardware and installation is somwhat different from installing conventional fiber optic cables. One has the tubing into which the fiber will be blown, special coated fiber or bundles of fibers which can be blown into the tubes, special hardware for termination and splicing and the blowing apparatus which provides the controlled air stream (or dry nitrogen) necessary for blowing the fibers into the tubes up top several km. The tubes come in many designs with single or some number of tubes inside a single jacket. Cables of tubes are installed like regular cables, meeting usual building codes. Couplings provide connections between tubes for longer runs or branching. Boxes of various designs allow routing tubes or terminating fibers. ABF has been used indoors, on ships, outdoors including FTTH or practically anywhere conventional cables are used. Since ABF can be used almost anywhere conventional cables can be used, the tubes must be designed for the same environmental requirements as regular cable. Indoor cables must meet appropriate fire codes and outdoor cables must be designed to prevent moisture damage. And since air pressure is being used to install fibers, the tubes require connections that seal properly to maintain air pressure along the path. Special fibers coated with a foamed plastic (polyethylene generally) are used for ABF systems. Single fibers up to bundles of 24 fibers can be used. Fibers are available from several vendors. The advantages of ABF are predicated on the installation of an adequate number of tubes initially. Generally, an ABF tube bundle will be larger than a equivalent conventional fiber optic cable and have a larger bend radius, so the cable plant design must take this into account. The economics of ABF vs. conventional fiber cables depends on the application and plans for the future. 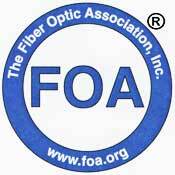 It may be more expensive in the beginning but less expensive to expand the number of fibers or change the fiber types. The tradeoff is to install conventional fiber cables with more fibers, even hybrid SM/MM cables, initially when extra fibers are relatively inexpensive.